If you ask for help, they will come. On Monday, people came. It may not have been a line of endless headlights winding through the rural Iowa farmland, but it was more than enough to breathe life back into one of America's most beloved baseball fields. "In the old days when a farmer would need help, all the neighbors would come together, and it feels like that," said Steve Bush. "The community comes together." 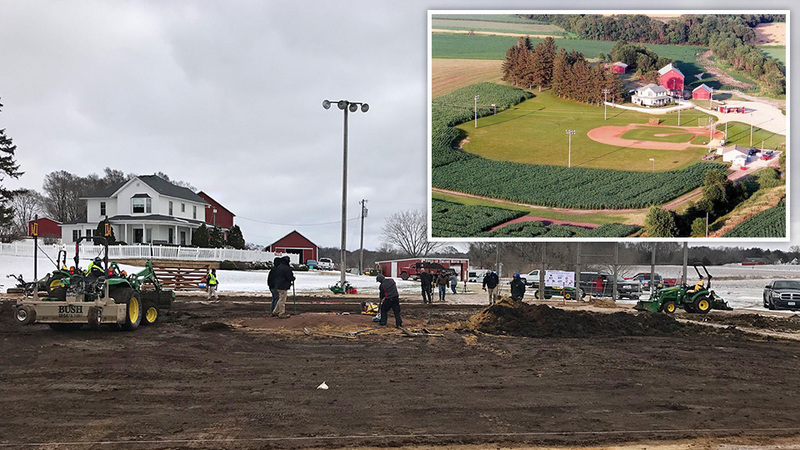 Bush was part of a volunteer team that assembled at the famed Field of Dreams field in Dyersville, Iowa, on Monday morning to help repair the playing field of the famous movie site after a man drove his truck across the infield three months ago. The damage done to the field on Jan. 22 ruined the grass, mound and infield and cut deep into the hearts of baseball and movie fans who've long regarded the cornfield ballpark as a magical place following the 1989 Kevin Costner film, Field of Dreams. Austin Pape, a 20-year-old man from Dyersville, was charged in February with felony second-degree criminal mischief and reckless driving after he tore through the field in his truck, cutting deep ruts into the playing surface. He pleaded not guilty after turning himself in on Feb. 1. Denise Stillman owns and manages the farm. She was stunned to wake up the morning after and see the damage done. "When we found it, it was heartbreaking," she said. News of the vandalism went public and fans across the world responded with donations for repairs after Stillman set up a GoFundMe page seeking $15,000. "I thought, 'That's a good idea,'" Stillman said. "We did one and within three days, we exceeded our goal. It blew me away. We still have checks coming in. Donations from all over the world." Minor League Baseball's office in Florida then rallied its local affiliates in the Iowa area with a plan to come together and fix the field for free. On Monday, staff and grounds crew members from the Triple-A Iowa Cubs and the Class A Midwest League's Cedar Rapids Kernels, Clinton LumberKings and Quad Cities River Bandits joined local high school and college teams, local volunteers and Bush's crew to repair the field. Stillman said the Chicago Cubs also sent her a $10,000 donation for repair expenses. "We're just so grateful for the contributions," Stillman said. Field of Dreams brings back a flood of memorable visuals from the farm in Iowa -- Moonlight Graham, Shoeless Joe fading into the corn, a father and son playing catch under the lights and an iconic James Earl Jones speech about the game. Baseball fans have continued to journey to the field ever since to play ball and soak in the nostalgia. "It is so humbling to have these volunteers come from three hours away," said Stillman, who opened up the iconic farmhouse kitchen to serve the volunteers lunch and hot cocoa. "To see the field coming back to its original condition -- it'll be even better than when it was built. NBC Universal built this field in a day. They didn't have this equipment, they didn't have the professional help that we do with Steve Bush and Minor League teams, so it's humbling and it's heartwarming. There's no way we could have done this on our own." A view of the field, with the truck's tire tracks visible in the snowy outfield. Bush, the owner of Bush Sports Turf in Milan, Illinois, specializes in building Minor League fields and repairing Major League playing surfaces after they're abused by concerts and events. He said he was happy to lend his equipment, team and expertise to the Iowa site. "They came out, they fed us lunch and it feels like the nature and the root of what this is all about," he said. "And that's what baseball is all about. It's America at its best." Reid Olson, the head groundskeeper for the LumberKings, a Mariners affiliate, said he was honored to work on the famed field. "It's an honor and privilege to be able to participate in a project such at this," he said. "Anybody who loves baseball and the game has some kind of feelings for Field of Dreams. I remember watching it as a younger man and it feels very special to be here and rebuild it so more people can continue to come." Olson and the crew first had to shovel off a layer of snow covering the infield. After that, the team ripped up all of the frozen grass and dirt and got to work leveling the field. They replaced the pitcher's mound, home plate and all the bases. "We're back-filling the soil, getting ready to lay sod," Olson said. "We took out the bases, the mound and put in a brand new plate and a new mound. All the bases are set to specification and once we get the sod laid, we'll laser-grade the infield and baselines and it'll be ready for play." Stillman said the donations from fans will go toward helping fix up the outfield and any damage that may have been done to the underground sprinkler system once they're able to evaluate it all when the ground thaws. Scott Wilson, the general manager of the Cedar Rapids Kernels, a Twins affiliate, drove over an hour to help out in the rebuild. "Right now after they put the new dirt down, we'll start adding the new sod," Wilson said as work continued Monday afternoon. "To get to walk away and see your sense of accomplishment later, it'll be super cool. And to see all these people working together -- baseball is a family, whether it's a movie or otherwise, so we're all attached." The infield takes shape as crews work to finish up renovations. Bush also said he was eager to help out. "We're not that far away, and we saw it on the news that somebody had torn up the field. We were contacted to help out, and it was just natural," Bush said. "That's what we do here in the Midwest. If people need help, we help out. "It's just wonderful to see the community here and this is what Iowa is all about," he added. "Seeing the Minor League groundskeepers here side by side with local people and the teams from high schools and college kids, it's fun to see everyone working together." "I think it's disappointing and heartbreaking to hear someone would drive all over the surface and ruin something that means something to a lot of people, given how many people come to take in this site," Olson said. "The Clinton LumberKings are so happy to be part of the effort with Minor League Baseball and everyone else involved." New sod had the field looking ready for baseball season. Stillman said the site will be open as usual as the weather warms up this spring and summer. Fans can make the pilgrimage to play ball, watch a game, walk into the cornfield and even tour the iconic white farmhouse. The field will again host a game featuring Major League Hall of Famers in September, too. Stillman said Wade Boggs, Ozzie Smith, Pudge Rodriguez and Alan Trammell will be there. "They're always encouraged to bring a bat, ball and glove" Stillman said. "Come join in pickup baseball -- at any time most days, people are hitting balls or shagging balls or having a catch, playing in the corn. Everyone gets a Christmas card photo in the corn. Come take a tour of the home -- for that there's an admission fee, and for the very adventurous, they can rent out the house and spend the night." But as the sun sets over Iowa, can you dramatically flip a switch on the porch and flood the old field with light? "For the people who spend the night, we put the lights on," Stillman said.